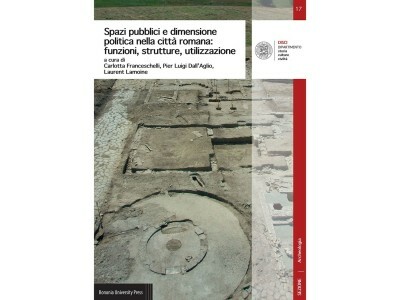 Spazi pubblici e dimensione politica nella città romana: funzioni, strutture, utilizzazione (Public Spaces and political dimensions in the Roman city: functions, structures, use) is the final product of two international meetings which took place between March and October 2015, the first in Clermont-Ferrand, the last in Bologna. The meetings’ main topic was public life and political administration in Western Roman cities. The aim of the encounters was to attempt a multidisciplinary approach to the research on public urban spaces. For that purpose, two basic lines of study were followed. One is related to the school of ancient topography of Bologna University, which can claim great scholars like Arturo Solari, Nereo Alfieri and Guido Achille Mansuelli, while the other, more historical, is linked to the Clermont-Ferrand University tradition and the research program led by Mareille Cébeillac-Gervasoni, to whose memory the book is dedicated. After the preface, where Carlotta Franceschelli defines the meetings’ main theme, the publication is divided into six chapters taking into account some specific aspects connected to city studies: the perception of urban spaces in modern historiography, inner changes in the city over time, urban spaces and political administration, urban spaces in their relation to power dynamics, town squares and streets. Laurent Lamoine concludes the book with his final and general observations. In order to deal with the problem of political aspects in urban spaces, it is first necessary to define what “public” means. In this context, the term is considered in its ancient meaning. A public space is both an unalienable place, with a collective intended use and property of the community in a strict sense, and either a building, a monument, or a space simply intended for community members and common use. In public areas different kind of activities took place and here the attention is mainly paid to the ones tied to city government, such as voting or central authority actions. Public areas are an integral part of urban fabrics and they need to be considered in their overall logic. For that reason, more than to single buildings, which are important as mediums of cultural, social and political messages, the attention is here focused on the city in its complexity, to highlight the different moments of urban planning and the organization of each structure in a wider and more complete context. The following guideline comes from Guido Achille Mansuelli’s lesson who postulated that buildings spatial disposition is not the result of a simply juxtaposition of structures, but “a response to common needs that puts urban setups and preferential paths into a code”. Within this general line of work, some specific subjects are examined like the question about circulation models, their applications and variations, about the relationship between public spaces and central power, or about the identification of diachronic changes and developments of these areas. The first chapter contains two historical reports on the perception of urban spaces in modern studies on Roman architecture by Cairoli Fulvio Giuliani (La Sapienza, Università di Roma) and on Gallic public spaces by Laurent Lamoine (Université Clermont-Auvergne). Cairoli Fulvio Giuliani explains the debate between the positivism and idealism positions regarding Roman architectural spaces and their interpretations. After him, Laurent Lamoine reports on historical research about public spaces in Roman Gaul from the printing of Ridot Buillot’s works at the end of the XIX century until the recent archeological acquisitions. The latter have demonstrated the material consistency of common intended spaces in Gaul, like temples and fora, sometimes connected to each other and outfitted with specific buildings. Following the conclusions by Laurent Lamoine the workshop has developed three big topics of research each one concerning different internal aspects. Due to the time elapsed between nowadays and the Roman Period, it is difficult to recognize public spaces sometimes, even in the presence of archaeological traces. Mario Pagano (Soprintendenza Archeologica delle Marche) is currently studying Herculaneum forum localization. He states that the actual town square should not be recognized in the cloistered square found during the XVIII century, but could be better placed in the Augustan civic basilica area, occupied, on its western side, by a great vaulted space which can be interpreted as capitolium foundation structures. Town squares are the place where the Roman cultural model meets current local demand , baring variations and new solutions in architectonical planning applications. Stefano Maggi (Università di Pavia) raises again the problem of the Cisalpine experience and the mediation in the fora’s architectonical settings and in the use of theatres as urban connection elements in transalpine cities. The author has inferred that due to the precocity of Cisalpine colonization these regions most likely acted as a trial area for Roman urban model applications, where different answers to forthcoming issues were found each time. These concepts, already adopted in the Cisalpine region at the end of the republican period, had been applied in transalpine colonies from the Augustan period, when a large number of provincial cities acquired their monumental appearance. The notion of public spaces is a complex concept concerning different kinds of activities and a range of interests. Not only town squares and their buildings are destined to public business or common use, but also streets and their infrastructures, for example. Philippe Leveau (Aix-Marseille University) chose the topic of how foreigners were received and livability in provincial cities. Through different examples from Africa and Gaul, he shows how Roman cities avoided having an exaggerated amount of internal traffic congestion by creating pedestrian areas in city centers and how town hospitality was assured by using private efforts. Streets were also part of internal paths connecting different functional points of the city, religious, political and social. A good number of examples have shown that urban covered walkways often defined clear itineraries within the city, especially between different sacred areas. The structures found in the Neris-les-Bains Pechin parcel seem to be limited in their number, on the basis of the most recent research led by Carlotta Franceschelli (Université Clermont-Auvergne). Archeological evidence has shown that these structures are not water cisterns, as postulated after old excavations, but a processional road foundation, probably covered, leading to the temple nearby. Epigraphic sources are very important in understanding the developing of public activities and in identifying the specific use of some buildings. Laurent Lamoine and Francoise Sudi-Guiral (Université Clermont-Auvergne), members of the research program Le quotidien institutionel des cités de l’Occident romain led by Mireille Cébeillac-Gervasoni, show us the example of Tabularia and its archives. The identification of these kinds of facilities is sometimes hard, because they could be arranged inside buildings with a different main use, like temples or basilicas. On the other hand, public mentions of the tabularia’s constructions and the people who built them show that some cities were outfitted with specific spaces for that use. While archives were spaces intended for preserving documents, capitolia where used to preserve and expose the city memory and its social identity. Lauretta Maganzani (Università Cattolica del Sacro Cuore, Milano) offers a political reading of Verona’s Capitolium, in relation to its decorative and epigraphic settings, and underlines its role as a cultural and ideological medium through which citizens spoke to the external world. After that Alessandro Cristofori (Alma Mater Studiorum, Bologna) chose the theme of the construction and maintenance of public spaces, reporting on his studies about curatores operum publicorum, based on epigraphic sources. Central power and local authorities gave this munus mixtum to local nobles, who took care of general necessities or specific buildings and they could also be responsible for the public heritage. Among the public activities are voting procedures. Virginie Holland (Hisoma, Lyon) takes into account this topic making a point on changes in voting rituals in the transition from the Republic government to the Empire in Rome and on a local level. The establishing of the Lex Valeria Cornelia introduced new phases during voting operations, like destinatio and designatio, respectively taking place in Campus Martius’s saepta and on the Palatine Hill, very close to the imperial house. The Lex Valeria Cornelia also demonstrates that the democratic vote survived after the end of the Republican period, not only in Rome, but also in municipal contexts as shown by some graffiti from Pompeii, attesting to aediles and duumvirs elections just before the eruption. Cyril Courrier (Aix-Marseille University) also starts from a graffiti, in particular one mentioned by Suetonius and hostile to Domitian’s construction politics. The reason the great arcs increased during the late Flavian period has to be researched in its relationship to imperial family celebrations, as the arcs were part of the Vespasian and of Tito’s apotheosis processes. Moreover, most of Domitian’s arcs seem to be monumental access structures delineating religious pathways and they can be related to Rome’s various sacred limits. One important aspect of public life in the Roman world was gladiator entertainments. Jesper Carlsen (University of Southern Denmark) makes a point about the state of our knowledge about spectacle buildings and gladiator fights in Minor Asia and Northern Africa using different sources of information. Public spaces are not static elements and they do not remain the same over time, but they change their forms and functions following city life developments. These variations are very noticeable in the transition moment between the Roman period and late antiquity as recorded by Pier Luigi Dall’Aglio (Università di Bologna) and Paolo Storchi (Sapienza, Università di Roma/SAIA) in Regio VIII urban patterns. Urban space contraction, city wall modifications, reuse of building materials from public monuments, are all a manifestation of the economic and military crisis in the region during late antiquity. Blaise Pichon (Université Clermont-Auvergne) highlights a parallel situation for Gallic town squares between the III century and the V century A.D. Bavay, Vieux, Paris and Amiens fora all show signs of functional changes and private use of public spaces, which often became building material quarries which demonstrates a profound change in civic administration. Cities are always changing, not only during the late antiquity crisis. Rome is the prime example in that sense as shown by Luisa Migliorati (La Sapienza Università di Roma) with her article about Rome’s metamorphosis. Mutations in Rome’s city center are due to the constant demolition and reoccupation of central spaces, like the fora area, which started during the Caesarian period and went on until the Second World War. As a whole this book contains a global vision of current questions linked to public space in Roman cities from the point of view of their functions, their structures and their different uses. Furthermore, it shows how this field of research must follow a multidisciplinary approach in order to understand common spaces better in terms of their different layers. In fact, some of them can be better understood starting from archeological evidence, while others can only be appreciated by reading epigraphic or historical resources. Only by taking into account every different kind of source in its complexity, can we reach a reliable interpretation of the past.